At UpStream Toronto Harbour Cruises we believe that the key to a memorable corporate functions, meeting, party, wedding, special occasions or social is the blend of splendid wait staff, and impeccable food, entertainment, themes and decorations. 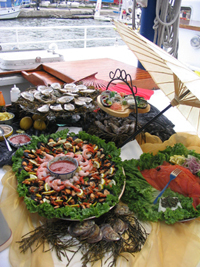 At Upstream Harbour Cruise Line, we offer a wide range of catering services for our charming ships and customers. Our professional caterers ensure that the planning, organization, catering, detailing and decorating of mid-large group conference / meetings, dinners, corporate parties, weddings, receptions and private parties. We offer a wide range of menu selections to suit every taste; a la carte options, Buffets, luncheons, dinners, BBQs, fine cuisine, seated dining, fully licensed bar. All food is freshly prepared daily by our on-board kitchens / galleys and our talented chefs. Our UpStream Harbour Cruise professionals are here to assist you in the planning of a successful event. Our catering services include the coordination of photographers, audio-visual equipment, PAs and microphones, podiums, Indoor Games, Casinos, Fun Games, Dinning, Dancing, live DJs, hired entertainers: dancers, singers, musicians / bands, comedians, mimes, clowns, psychics, artists, ice sculptures, themes, decor services, balloons and flower arangements. Contact Us today to find out more about how we can make your event that more unique!